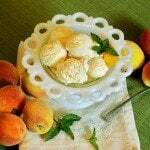 Fresh peach ice cream made with peaches right off the tree, heavy cream, sugar, and vanilla is easy, simple, and delicious. Fall is in the air here in southern Utah. The nights are cool even tough the day can still be blazin’ hot. I love this time of year because you can swim and eat ice cream during the day and make a fire to roast mallows on at night. I’m so glad I live here; it is beautiful. Utah has lots of pioneer heritage and those pioneers were wonderful about planting fruit trees wherever they went. There is a three story apple tree in my neighbors yard that I’m sure is pioneer planted. I would have never thought of Utah as being a great place to grow fruit, but it really is. The warmth mixed with plenty of irrigated water from the mountain really does well for fruit. Right now peaches, plums, and pears are ripe while we wait for our apples to sweeten with the onset of cold. Mmm, I love apple season. What fruit is ready in your neck of the woods? Do you have any trees of your own? This recipe is a great way to use fresh peaches for dessert. 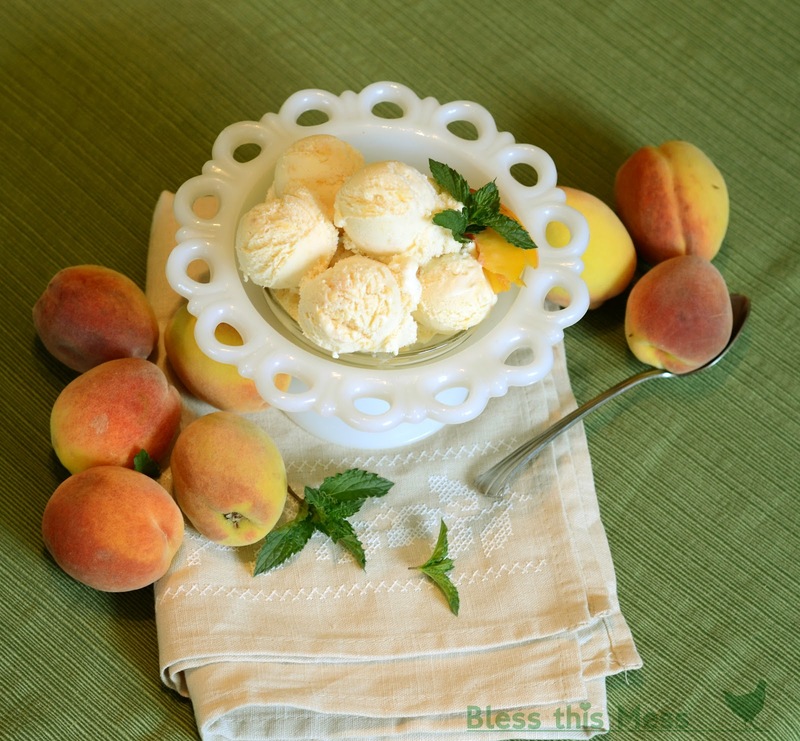 Fresh peaches and ice cream is a combo that is just meant to be. 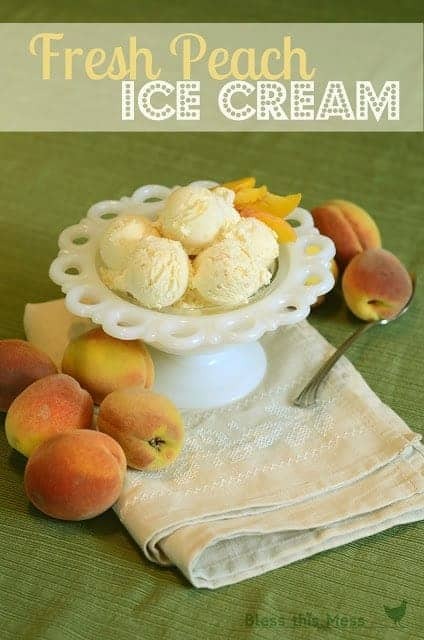 It’s simple to make, is full of peach flavor, and has a perfect creamy texture with just the right amount of sweetness. This is a favorite to make a batch or two of and keep in the freezer while peaches are in season. We can’t get enough fresh peach ice cream so we indulge when it’s here. If the peaches don’t want to blend up try adding part of the milk called for to help things move around. If you like more chunks in your ice cream, blend up 1/2 the peaches and dice the other half. 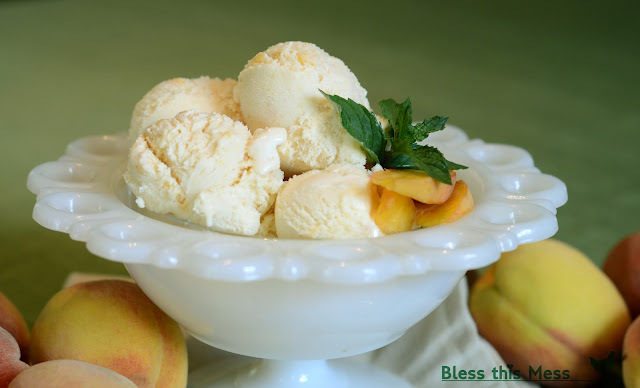 Add the diced peaches to the ice cream just before serving. Add the peeled and pitted peaches to a blender or food processor and blend until smooth. In a medium bowl mix the peach puree, milk, sugar, heavy cream, vanilla, and salt together until the sugar dissolves. Add the ice cream mixture to your ice cream maker and process according to manufacturer’s directions. If the peaches don’t want to blend up try adding part of the milk called for in the recipe to help things move around. If you like more chunks in your ice cream, blend up 1/2 the peaches and dice the other half. Add the diced peaches to the ice cream just before serving. If you like a harder ice cream, put the churned ice cream in a freezer container and cover. Let it freeze for at least 2 hours and then let it sit for 10 minutes on the counter before serving. The ice cream straight out of the maker is just like soft-serve. Out of the freezer it is like store-bought. So many peach and ice cream desserts to choose from! ENJOY! This post was originally published in September 2012 and has been updated in August 2018. Mmmmm!! My mouth is watering, I’m so making this! Thanks for sharing! I LOVE this. We have peaches on one of our trees and have been dehydrating, freezing, and just plain eating everything we can salvage from the wasps. I’m going to have to try my hand at this recipe sometime soon! Thanks for sharing, and your pictures are gorgeous! The ice cream is delicious but there isn’t much of a peach flavor to the ice cream even though I wound up using 5 peaches! (I added the extra peach to help give more flavor) The recipe looks like it calls for one tablespoon but I used one teaspoon because I figured that a tbsp was too much. It turns out that a tsp is also too much. Overall the flavor (Even though it was more vanilla than peach) and consistency was great. I also use a Cuisinart ice cream maker and it is great! If you use fresh lemon juice instead of vanilla, the peach flavor comes through. Everytime I make ice cream in my Cusinart (which I love) we seem to always taste the vanilla. Sometimes its all we taste. Even if I add a ton of things. The only one in which we didn’t was the peanut butter ice cream but it was still there. Any advice for how to curve the over powering vanilla taste? Maybe cut the vanilla in half?! I have no idea why the ice cream maker would matter but it sure could. Have you played around with their recipes much?! Don’t use any? Why not? That’s logical, right? Just the recipe I was looking for….we have an abundance of milk and a box of peaches! Thank you! Quick and easy recipe. Next time I think I would do 1 tsp of vanilla and 7 puréed peaches. Thank you for sharing your recipes.What is the amount of peachs used ( in cups or ozs) ? Can I subsiitue this with fresh mango to make mango ice cream? Just use equal parts mango instead of the peach, it should be around 2 cups.